Step 2 Make the dough, place all the dry ingredients in a bowl and blend well. Step 3 Add the oil and egg and stir until combined. Step 4 Add the boiling water, gradually until you have a dough. Firm up with your hands. Step 5 Roll out the dough by placing it on a piece of parchment paper, place another piece of parchment paper on top, then roll out. Cut out circles to cover the muffin tin spaces (I used a wine glass, but a large cookie cutter would do too). Step 6 Place the circles in a greased mini muffin tin and ensure that all the sides are covered with the dough. Step 7 Place about ¼ teaspoon of the Marinara sauce into each bomb. Step 8 Add Mozzarella cheese, pushing down until the bomb is full. Step 9 Gently squeeze the top edges of the dough together so that the dough forms little balls. Step 10 Sprinkle the tops with Parmesan cheese. Step 11 Bake for 20-25 minutes until the pastry is firm and golden. Step 12 Eat and argue over the last one! Pizza bomb bites made with a low carb and gluten free dough that ooze out Marinara sauce and mozzarella cheese. 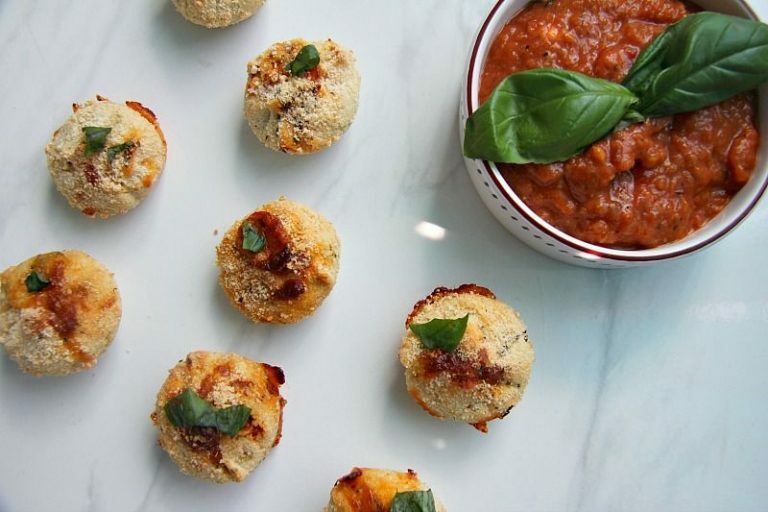 If you are a fan of pizza you will love these little bombs of pizza bites.